In February, a new producer-directed advertising campaign called “Open Doors” launched for the beef checkoff. The cattle-ranching Soucie family of Cambridge, Nebraska, are featured in the national ads.The “Open Doors” concept was born from the creative insight that you never know what you’ll find when you open a door. We open them to let someone or something in that was previously left out. We open them when others can’t open them for themselves. And we open them because progress doesn’t happen if they remain closed. 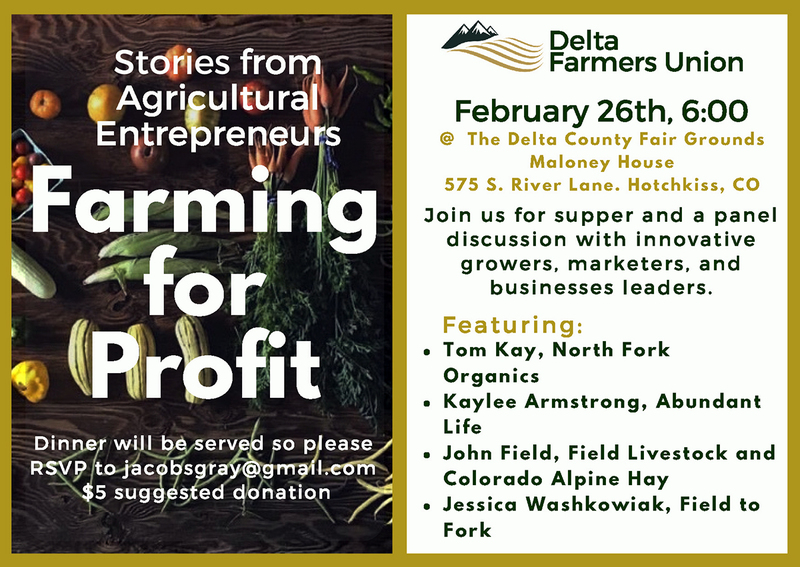 02-15-18 Farmers For America Documentary in Montrose, CO on Feb 25th – Don’t Miss It! 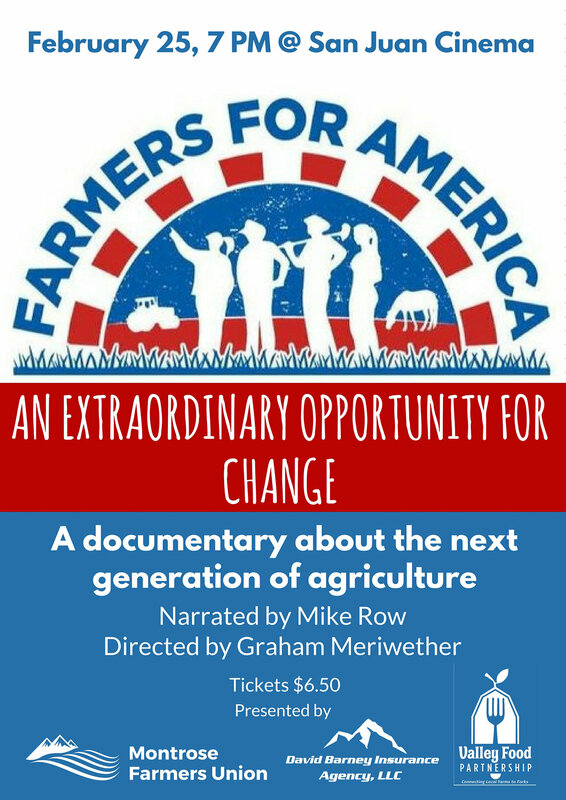 Farmers For America Documentary in Montrose, CO on Feb 25th – Don’t Miss It! HOW: Attend live-streaming of the Produce Safety Alliance’s Water Summit and participate in breakout sessions. Although the Water Summit will be held in Covington, KY on February 27-28, you can view the sessions live and participate in all the breakout sessions. More information on the Water Summit can be found here: https://producesafetyalliance.cornell.edu/water-summit. The 2018 RMFU Fellows are (from left) Hana Fancher, Dan Waldvogle, Nick Levendofsky, Rod Morrison, Emily Brown, Kyler Brown, Jacob Gray, Catherine Laskarzewski, Sondra Pierce, Nicole Didero, Shannon Garrison, Grace Perry, and David Laskarzewski. Not shown is Emily Hunter. The RMFU Fellows for 2018 met for the first time earlier this week. Fellows are chosen for being emerging leaders within their communities, in their production practices and businesses, and for being eager to learn new ideas and techniques. During their first session, the Fellows learned about Rocky Mountain Farmers Union, which is a leading general farm organization in Colorado, New Mexico, and Wyoming. The Fellows also visited with Lee Swenson, senior advisor on Colorado rural policy to U.S. Senator Michael Bennet. Tom Lipetzky, director of marketing programs for the Colorado Department of Agriculture, offered his insights to the group. April Dahlager of USDA Rural Development explored the business and cooperative development programs available through USDA. The Fellows will meet this summer and again in September, when they will participate the legislative Fly-In to Washington, D.C.
DENVER — Responding to testimony from hunters, anglers, state park visitors and volunteers about the need to provide a long-term funding solution for Colorado Parks and Wildlife, the Senate Finance Committee unanimously passed, 5-0, the Hunting, Fishing, and Parks for Future Generations Act (Senate Bill 18-143) late Tuesday. Lawmakers credited CPW leadership for conducting exhaustive statewide public outreach and using the feedback to resubmit an improved proposal that lays out specific ways money generated by modest fee increases would be used, such as fixing deteriorating dams, recruiting new hunters, expanding conservation efforts and looking for ways to increase outdoor recreation opportunities for all Coloradans. Bipartisan legislation in the Senate would exempt farmers from reporting requirements for animal waste emissions. The bill seeks an exemption for farmers and ranchers from the Comprehensive Environmental Response, Compensation, and Liability Act and the Emergency Planning and Community Right-to-Know Act. The bill was introduced by Nebraska Republican Deb Fischer and Indiana Democrat Joe Donnelly earlier this week. In a statement, Fischer noted that in 2008, the Environmental Protection Agency published a final rule exempting most livestock operations from the laws’ reporting requirements, but that last April, a federal appeals court ruled EPA did not have the authority to create the exemption for agriculture. Known as the Fair Agriculture Reporting Method, or FARM Act, the legislation will maintain the exemption for certain federally registered pesticides, exempt air emissions from animal waste on a farm from reporting requirements, and provide agriculture producers with greater certainty by reinstating the status quo producers have been operating under since EPA’s 2008 final rule. A former Obama administration trade official says there is too much left to do before the deadline for the North American Free Trade Agreement talks. Former Chief Agricultural Negotiator for the U.S. Trade Representative, Darci Vetter, told Agriculture.com the negotiations “have a long way to go.” Noting that some issues don’t have an assigned approach yet by the administration, she says: “There are some technical issues, like the rules of origin, that are really complicated to advance.” Vetter warns the talks could harm trade with Mexico, the top buyer of U.S. corn. Vetter noted that before NAFTA there was little competition for the U.S. as an ag supplier to Mexico. However, she noted that competitors such as Australia, New Zealand, Argentina and Brazil, could take part of U.S. exports of corn to Mexico. Adding to the possible delays in getting the trade talks wrapped up on time, Vetter highlighted the fact that Mexico will face elections this year followed by the coming elections of the United States. Canada expects trade challenges from the U.S. will continue even if the North American Free Trade Agreement talks are successful. a senior Canadian government official says: “Even if a new NAFTA were to be signed tomorrow I think we would still face a lot of turbulence in our relationship with the United States on trade.” Timothy Sargent, the top bureaucrat in Canada’s Trade Ministry, noted recent U.S. moves to impose duties on Canadian softwood lumber, commercial airliners and some paper products, as examples. All were prompted by complaints from American firms, according to Reuters. He also pointed out President Trump’s move to place duties on imports of solar panels, saying “I think we can expect more of that.” Meanwhile, President Trump recently again threatened a U.S. withdrawal from the talks if the U.S. does not reach a favorable agreement. However, Canada has recently done the same. The United States Cattlemen’s Association wants the Department of Agriculture to clarify the definition of beef. USCA late last week submitted a petition to USDA’s Food Safety and Inspection Service asking the agency for rulemaking on beef labeling to clarify for consumers what is beef derived from cattle and “beef” products created in a laboratory. USCA Presider Kenny Graner says: “U.S. cattle producers take pride in developing the highest quality, and safest, beef in the world, and labels must clearly distinguish that difference.” USCA is not the only industry group asking questions about how lab-grown meat will be regulated, according to meat industry publication Meatingplace. The North American Meat Institute also made it a hot topic at the recently held International Production and Processing Expo in Atlanta, Georgia. Agriculture Secretary Sonny Perdue will speak at the upcoming Commodity Classic in Anaheim, California. Held February 27th to March first, Perdue will be the keynote speaker for Wednesday morning’s general session of this year’s event. Secretary Perdue is expected to share his vision for the U.S. Department of Agriculture including his thoughts on a new farm bill, international trade, rural development and the role of agriculture in America’s food security and economic vitality. Following Secretary Perdue’s keynote speech, the audience will hear an inspiring presentation from Army Ranger Keni Thomas, who was a member of the harrowing 1993 military mission in Somalia that was recounted in the movie Blackhawk Down. Learn more about the event at www.commodityclassic.com. Grocery Manufacturers Association CEO Pamela Bailey will retire later this year, following ten years of leading the organization. Bailey will continue in her role as CEO while the association’s board of directors searches for her replacement. In a statement, the association thanked Bailey for her service, saying her leadership was “valuable during an evolving time in the industry.” During Bailey’s tenure, GMA led the industry in supporting modernization of the nation’s food and product safety laws and regulations, resulting in the passage of the Food Safety Modernization Act. The retirement announcement comes as a handful of member-companies have dropped their membership since the GMO labeling law was signed by then-President Barack Obama. Companies within the food industry have been unable to come to a consensus of opinion on GMO labeling.